Prime Minister Sheikh Hasina left here this morning for Singapore on a four-day official visit to the Southeast Asian country at the invitation of her Singapore counterpart Lee Hsien Loong, reports BSS. A VVIP flight of Biman Bangladesh Airlines carrying the prime minister and members of her entourage took off from Hazrat Shahjalal International Airport at 8:30 am. Industries Minister Amir Hossain Amu, Road Transport and Bridges Minister Obaidul Quader, PM's Adviser HT Imam, Jatiya Sangsad Chief Whip ASM Feroz and State Minister for Foreign Affairs Md Shahriar Alam were present at the airport to see the premier off. Besides, the cabinet secretary, the chiefs of three services, the inspector general of police, the dean of the diplomatic corps and high civil and military officials were present on the occasion. The flight is scheduled to reach Changi Airport in Singapore at 14.45 pm local time. From the airport the prime minister in a ceremonial motorcade will be taken to Shangri-La Hotel where she will be staying during the visit. 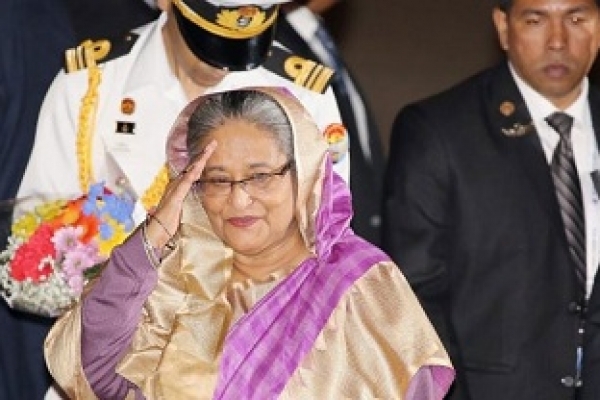 On Monday, Sheikh Hasina will be given a welcome reception by the Singapore government. After the welcome reception, Sheikh Hasina will pay a courtesy call on Singapore President Halimah Yacob at Istana. On Tuesday morning, Sheikh Hasina will attend a ceremony where an orchid in Singapore Botanical Garden, also world heritage site, will name after Prime Minister Sheikh Hasina. Later, she will join Singapore-Bangladesh Business Forum and Business Roundtable at Shangri-La Hotel as chief guest. Foreign Minister AH Mahmood Ali, State Minister for Power and Energy Nasrul Hamid and senior government officials will accompany her during the tour. A high-level business delegation will also accompany the PM.